NOVEMBER | PAGE 54 | 2014 BY STEVEN HEMPEL. ART DIRECTION MICHELLE AVIÑA. PHOTOGRAPHY SCOGIN MAYO. HAIR AND MAKEUP KATE YANCEY. We get out of life what we put in. Travel plans are set aside, work becomes life, and the process repeats. Yet when it comes to happiness, it's often the simple pleasures in life that mean the most. Michael and Robyn Siegel, husband-and-wife founders of Green House Market in NorthPark Center, lead a life that blurs the lines between art, food and life's moments. 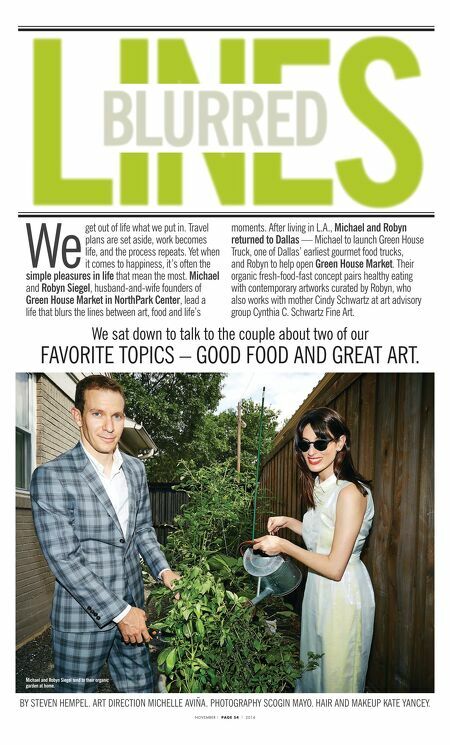 After living in L.A., Michael and Robyn returned to Dallas — Michael to launch Green House Truck, one of Dallas' earliest gourmet food trucks, and Robyn to help open Green House Market. Their organic fresh-food-fast concept pairs healthy eating with contemporary artworks curated by Robyn, who also works with mother Cindy Schwartz at art advisory group Cynthia C. Schwartz Fine Art. Michael and Robyn Siegel tend to their organic garden at home. 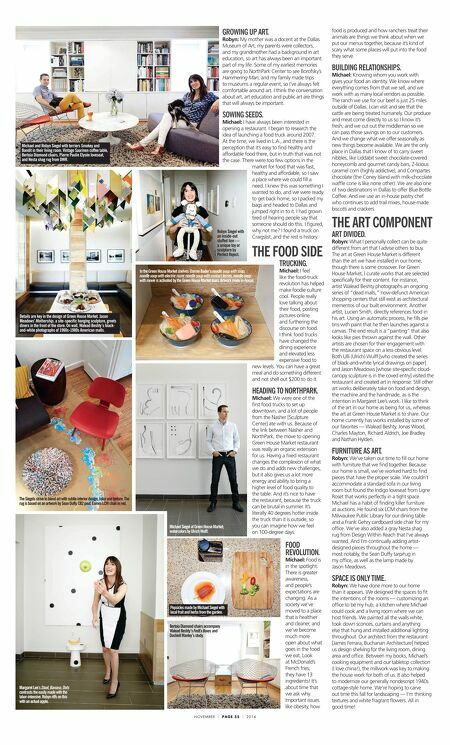 We sat down to talk to the couple about two of our FAVORITE TOPICS – GOOD FOOD AND GREAT ART.